Thomas Callender Campbell Mackie MBE ARIBA ARIAS (1886-1952). Mackie was a Scottish painter in oil and pastel of landscapes and flowers. He was also a lithographer, designer and etcher. He was educated at Larchfield School, Helensburgh and also Glasgow School of Architecture. He was head of design at Glasgow school of Art and Author of Pattern. Mackie was a member of the Glasgow Art Club. 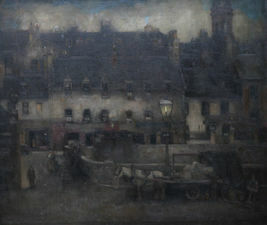 He exhibited regularly, Royal Scottish Academy 48, Glasgow Institute 77, also once at the Royal Academy. His work is represented at several major art galleries.